Rasta bros. Authentic Jamaican Jerk Marinade is created from the recipe passes to us from the Pork Pit in Montego Bay. Since 1982 the infamous Pork Pit, located on the Hip Strip, has been serving jerk chicken, pork and other Jamaican specialties to both locals and tourists alike. A gentleman by the name of Mr. Taylor taught us how he mixes the jerk rub and how to “season up” the chicken and pork. Like Mr.Taylor, we use nothing but authentic ingredients including Scotch bonnet peppers. Often confused with their habanero cousin, Scotch bonnets have a sweet-smokey taste that gives jerk dishes their unique flavor. 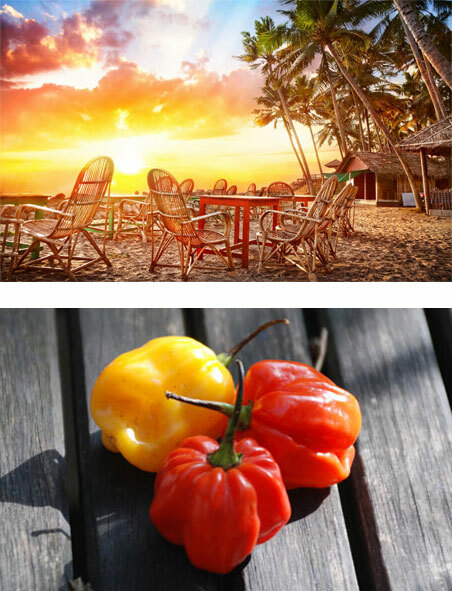 Jamaica’s motto is “Out of many, one people” and Jamaican jerk dishes are as diversified as the people of Jamaica. Flavors can range from a mildly spicy taste to “Hey Mon!” Der be a fire in mi mouth!” Rasta Bros. strives to be somewhere in the middle. We like some kick, but not so much that you can’t experience the flavor without a fire extinguisher.